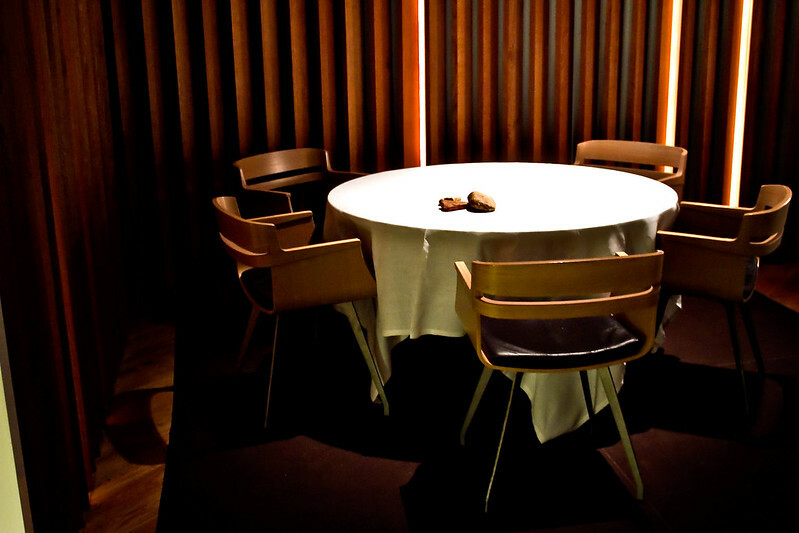 The restaurant was second on San Pellegrino's The World's 50 Best Restaurants list when we dined there in 2012 and originally wrote this feature. 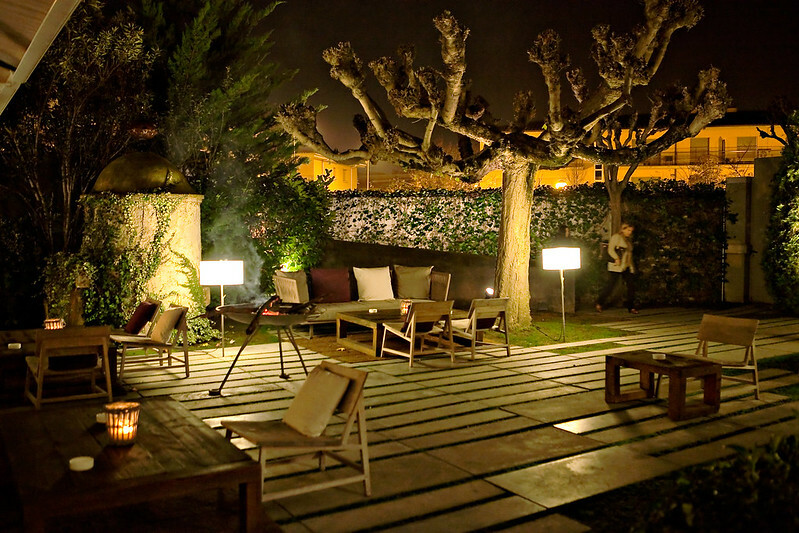 El Celler de Can Roca has since moved to the number one spot for 2013. Back in July, I sent a reservation request to the restaurant for certain dates in November. They responded to say that the restaurant was fully booked until January! I was so disappointed because I was planning a foodie adventure around San Pellegrino’s best restaurant list. 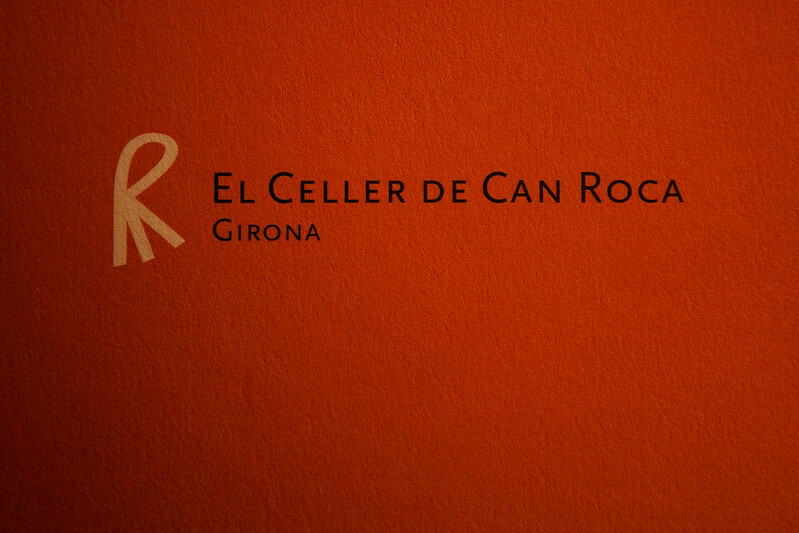 Being that El Celler De Can Roca was ranked 2nd, I really didn’t want to skip over it. Luckily, I got an unexpected email from the restaurant several days later saying that we were confirmed for 9pm on November 20th! We read good things about the restaurant and couldn’t wait to experience it all first-hand. On the evening of our reservation, we took a taxi ride to the restaurant. The ride was disorienting because we were headed away from the city center into a more residential area. The restaurant is nondescript and the sign almost blends to the wooden wall it is mounted on. The restaurant looks like a walled-in mansion from the outside. 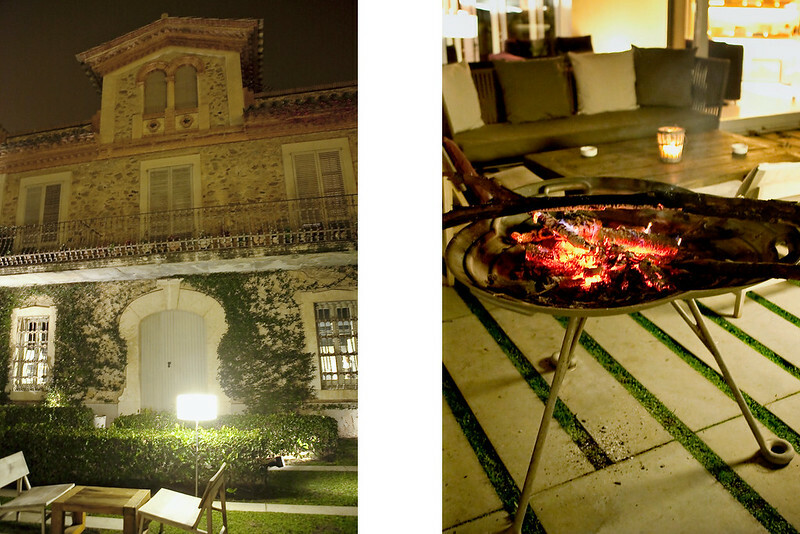 An open fire welcomes you to the courtyard and warms the chilly winter air. We approached the reception desk where they checked us in. As we waited, we saw empty crates that had pictures of fishes. 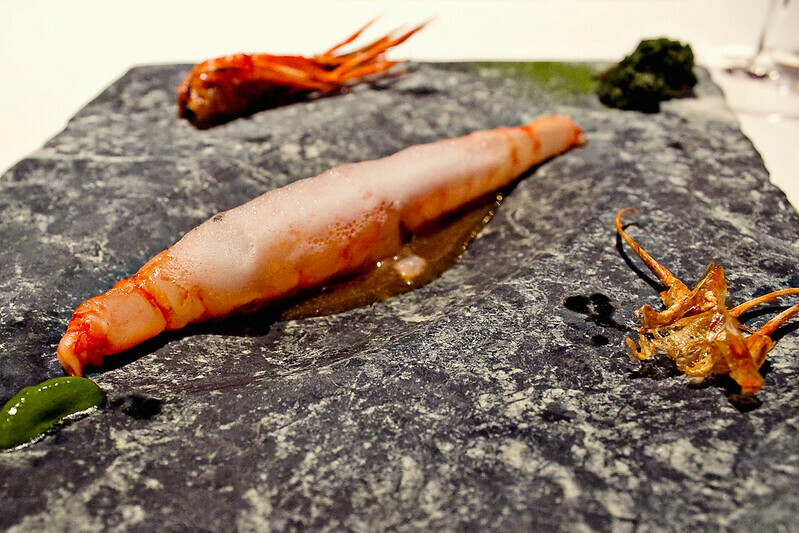 A reminder to its guests of how big a role seafood has in Catalan cuisine. 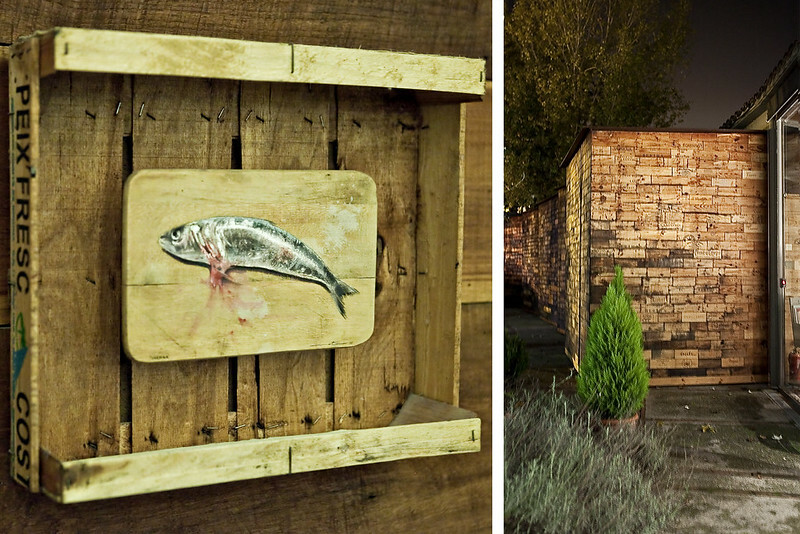 There were also wine crates used to decorate other areas of the property. The sommelier approached us and asked if we wanted to tour the kitchen and the cellar. He was Josep Roca, one of the three Roca brothers. He opened the doors of what looked like a library. But instead of books, bottles of wine were stacked neatly on racks on one side. On the other, five rooms dedicated to his favorite types of wine. 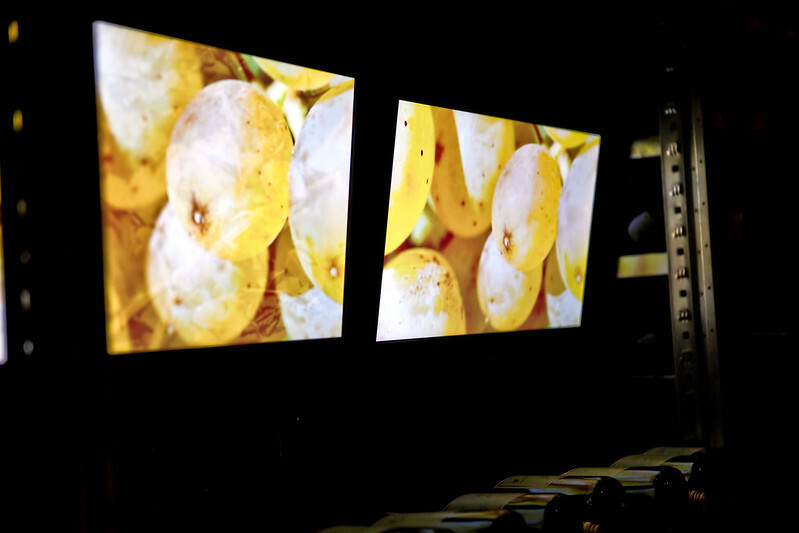 Each room had LCD monitors that played images and music of the region where the highlighted wine came from or the feelings the wine evoked. 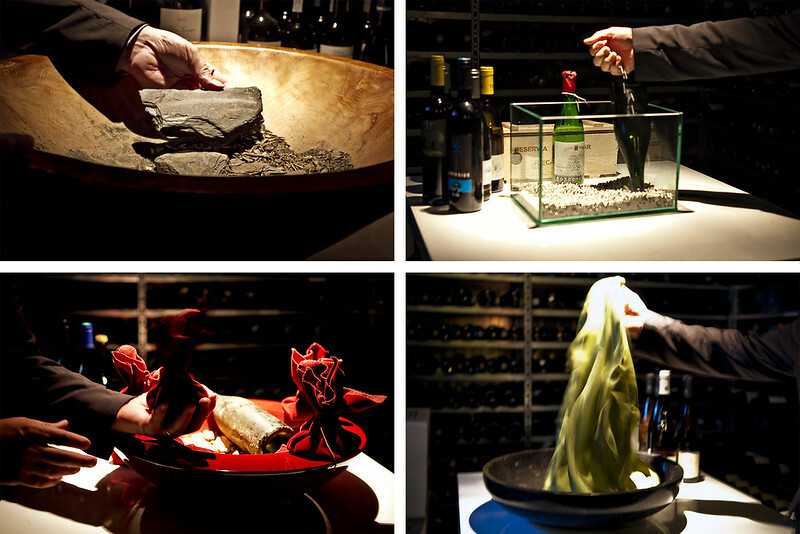 And to make the experience even more unique, Josep used objects that for him represented the qualities of the wine. The whole presentation was like an art installation curated by Josep. We were already impressed! Priorat: A type of wine from the Catalon region. The dark and obscure characteristic of the wine was depicted by the sound of a violin cello. The wine was represented by a slate that embodies the wine’s bold personality and imperfection all at once. 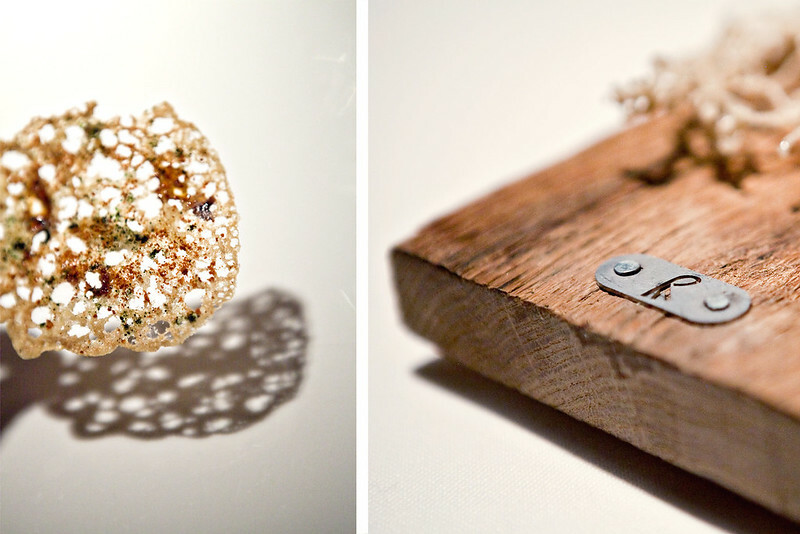 Champagne: The wine was represented by tiny metal balls that Josep carefully dropped against the wine bottle within a glass box. His action was meant to elicit feelings of lightness and playfulness, similar to the that of champagne bubbles. Pinot Noir: Josep explained that this wine represented sensuality and fragility while a violin cello was playing overhead. He likened this wine to a red pouch made of velvety cloth signifying the heart. Deep, passionate and vulnerable. Riesling: The wine that elicits happiness, enthusiasm, and silkiness all at once based on Josep's interpretation. These feelings were all represented by a vibrant-colored silky cloth embodying the friskiness, tension and acidity of the wine. 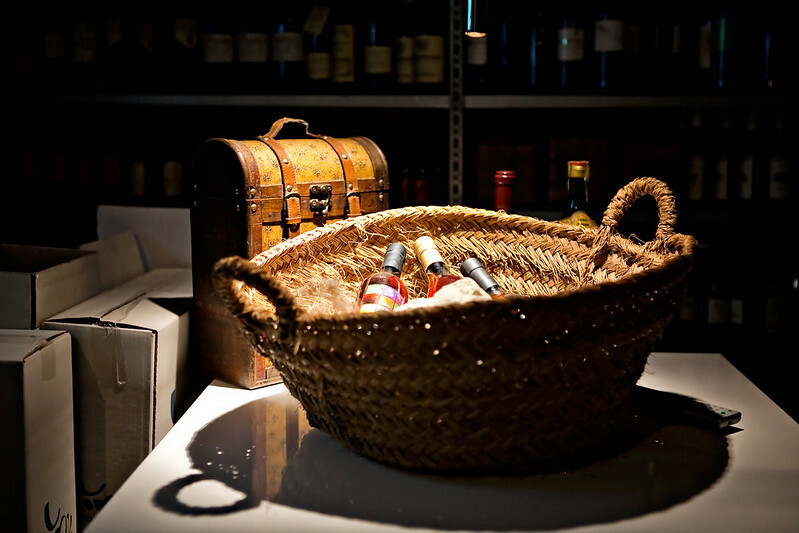 Sherry: A powerful salted and bitter wine symbolized by an “Albariza,” a typical stone from Jerez, lying in a picnic basket. As the wine was being presented, a Catalan flamenco music was playing in the background. Although flamenco lies in the heart of Southern Spain, where Jerez is, Josep specifically sought out Catalan flamenco to make the experience closer to home. 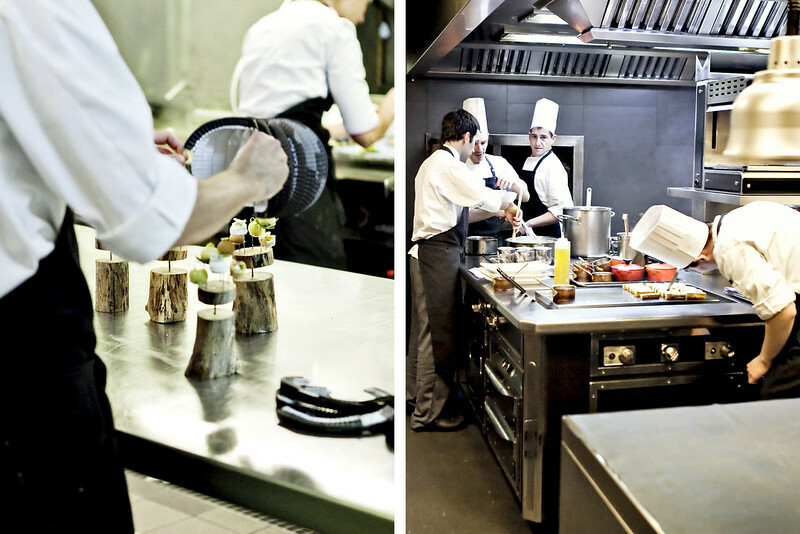 After an interesting trip to the wine cellar, we were brought to the kitchen to witness how dishes were being prepared. It was madly busy inside but people were cheerfully working at their craft. The dining room was spacious and in the middle, there was a triangular space courtyard filled with birch trees enclosed in glass. We chose the Festival Menu with wine pairings. We are not heavy drinkers so we decided to split between the two of us. Our amuse bouche consisted of seven dishes. The World: This came wrapped in black and white paper globes. Inside, there were five bite-size servings representing the flavors and produce of five different countries. Scandinavia (cheese with dill), Japan (miso and wasabi), Morocco (tajine spices with minty aftertaste), Mexico (avocado and lime), and Peru (ceviche). Each had its own unique taste, subtle yet flavorful. 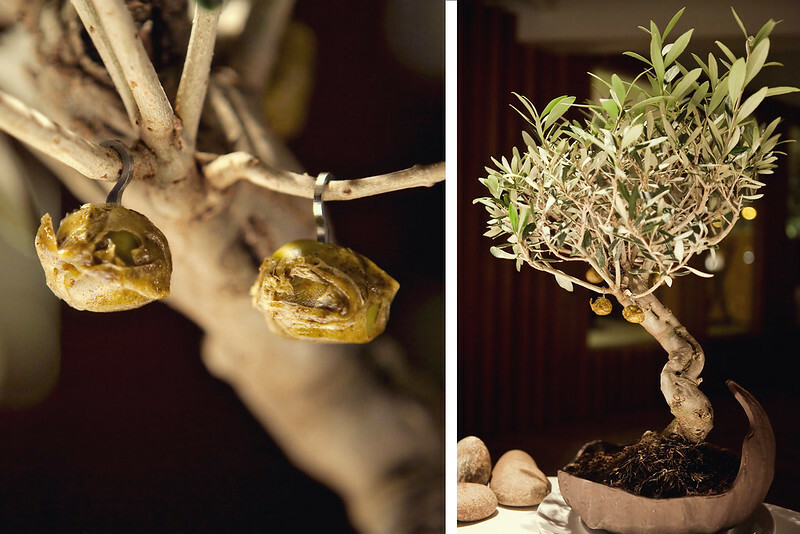 Caramelized Olive: Four pieces of caramelized olives served on a real bonsai tree. Each of them filled with salty anchovies. Who would have thought that caramel, olives and anchovies go well together? They were heavenly and left us craving for more. Crispy Fried Fish: El Celler's version of fried fish was served to us in a form of these delicate flakes sprinkled with seaweed bits and various spices. For a very small serving, the flakes tasted like fresh fish. 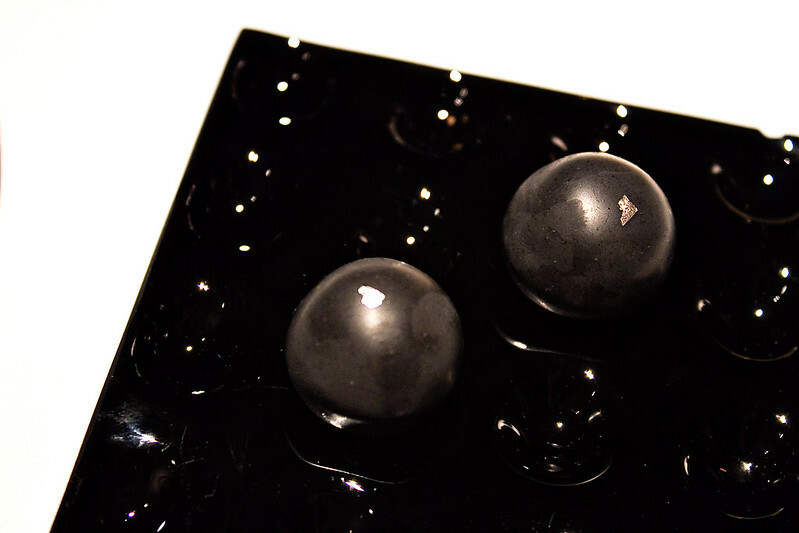 Camparo Bonbons: These delicate bonbons came with a surprise of their own. A flavorful filling of bittersweet and citrus mixed with sesame seed oil bursted in our mouths when we bit into them. Artichoke Omelette: We were told to eat the whole serving at once. And so we did. It was a gel-like and had the flavor of real artichokes. It tasted earthy and delectable. 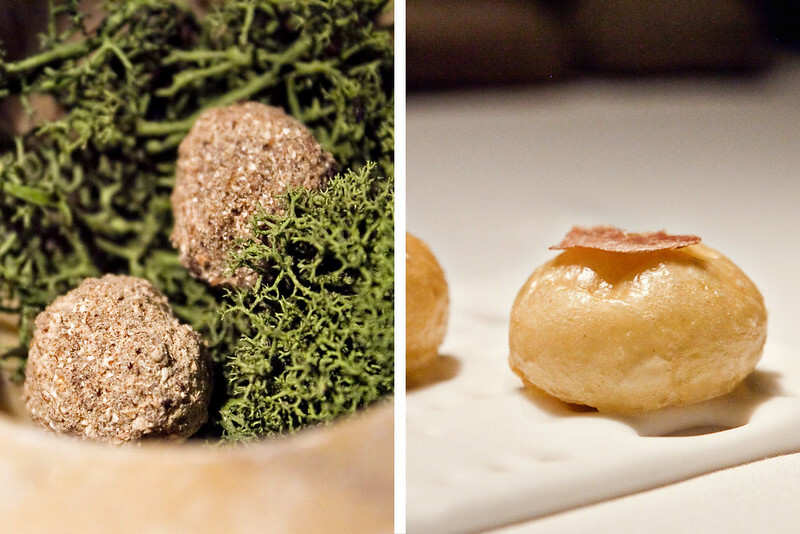 The last two amuse bouche were all about truffles. 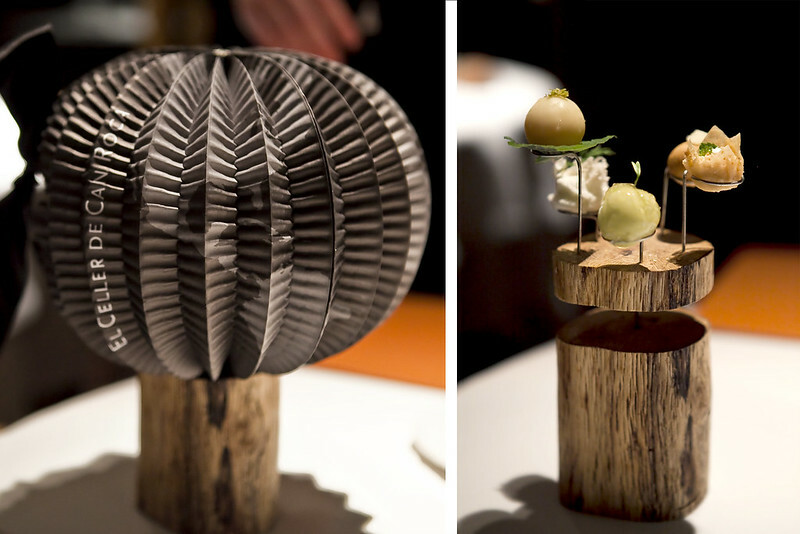 White Chocolate Truffle: (On the left) Served on real truffles, they were heavenly and truly enjoyable. Each piece just melted in our mouths. Brioche with White Truffle: (On the right) These were light and fluffy buns with its inside oozing with warm decadent truffle cream. Next up were the appetizers. 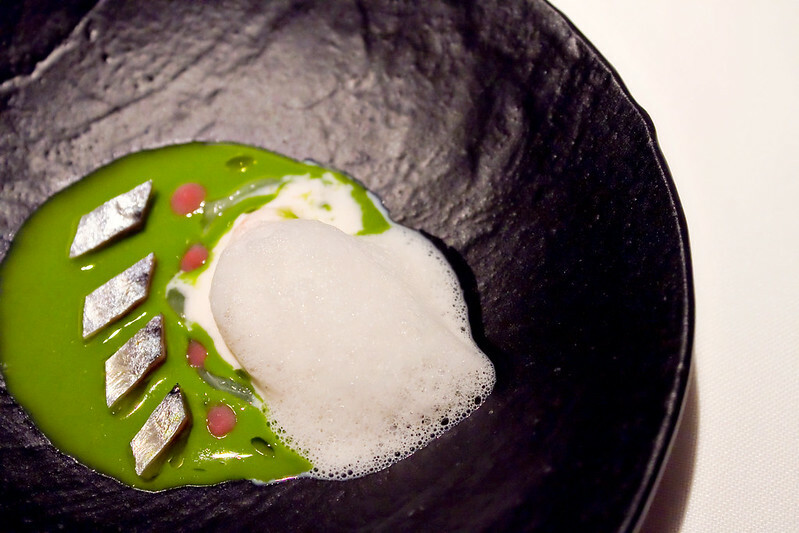 Green wheat with smoked sardine, grapes, toasted-bread and olive-oil ice cream and yeast foam: Each ingredient made this dish a memorable one. The rich taste of smoked salmon was prevalent. But the leafy taste of the green wheat cream and the subtle sweetness from the toasted-bread ice cream somewhat neutralizes the whole flavor of the dish making each bite delicious. Olive Paste: This serving highlighted a great variety of olives in many different shapes and form. 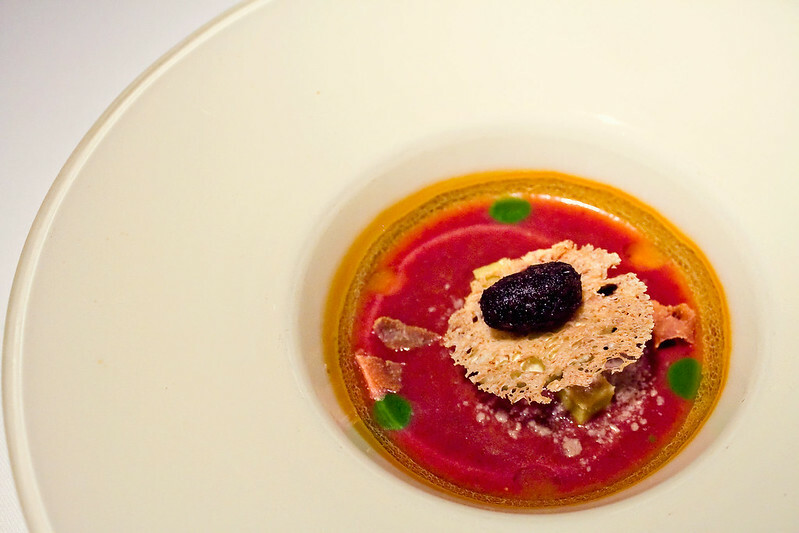 The gazpacho was made of black olives, the mousse from gordal olives, ice cream from manzanilla olive, and picual olive jelly. The taste was intense and nicely balanced with the toasted bread and fennel jelly that also came with the dish. One of my favorite dishes. I can still remember how the mousse felt like tiny bubbles in my mouth. 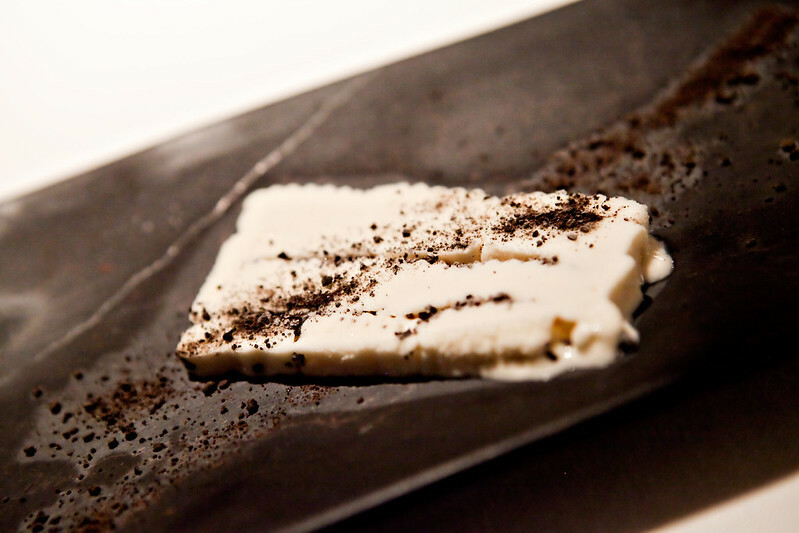 White Asparagus Vienetta: White asparagus ice cream with truffle powder inspired by vanilla ice cream with chocolate. The asparagus was very present in this mildly sweetened frozen delight. The ice cream was velvety and rich which contrasted well with the crunchy bits of the dried truffle. 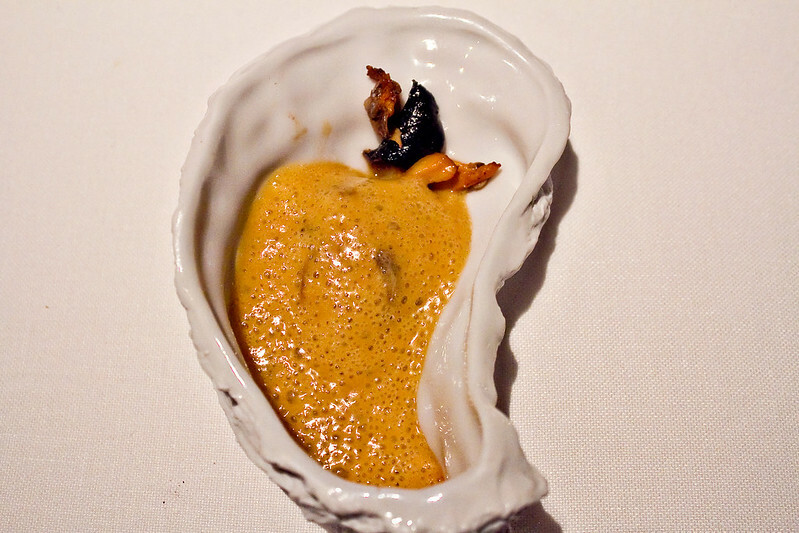 Oyster with Game Meat Hollandaise Sauce: Served in a porcelain shell mimicking that of a shellfish, there was an oyster concealed underneath a buttery hollandaise foam. 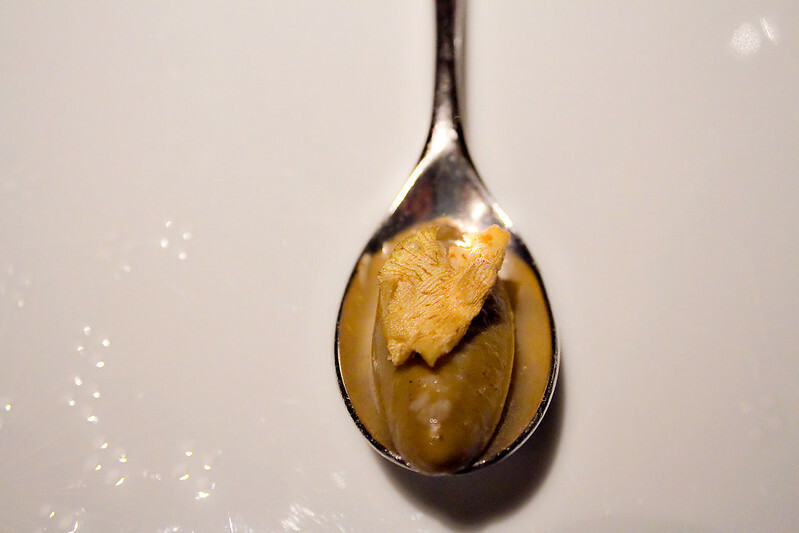 The oyster was fresh with just the right amount of saltiness. A Whole Prawn – Charcoal grilled king prawn, head juice with seaweeds, seawater and sponge cake of plankton: When a whole king prawn was served in front of us, the server told us that we could eat everything on the plate including the head and the legs of the prawn. The head was juicy and savory, while the legs were crunchy and deep-fried. Each were lightly seasoned to maintain their true flavor. The body of the prawn was smoked and sweet. It was soft but not soggy. Scrumptious its own way. 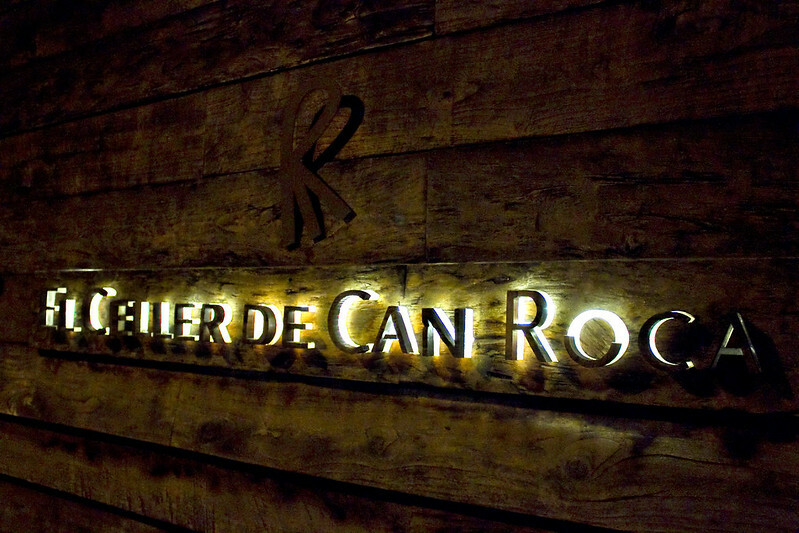 Stay tuned for Part II of El Celler de Can Roca; the mains and desserts!